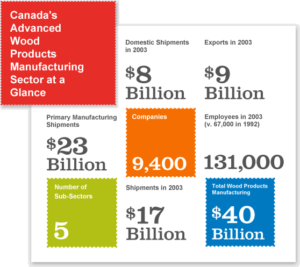 Canada’s advanced wood products processing sector is large and growing. It makes a significant contribution to the Canadian economy through the numerous businesses and enterprises that make up the sector, the large number of people who earn a living working within it, and the wide variety of products produced and sold to customers worldwide. Advanced wood processing is comprised of five sub-sectors – furniture, cabinets, windows and doors, millwork, and factory-build housing and building components. Within these sub-sectors there are over 9,200 companies. The sector is diverse and includes a substantial number of furniture manufacturers – ranging from household to office furniture, and producing casegoods and ready-to-assemble products. These products have various channels of distribution and ultimately are focused on the final consumer. Canada’s forests represent the third largest supply of wood-related natural resources worldwide, ensuring a continued source of materials for advanced wood products. The sector serves a sizeable domestic market, but nearly half of its output is focused on export markets. It exports a significant volume of products – mainly to the United States, but also to Japan and smaller volumes to several other markets. The total value of the sector’s manufacturing shipments was estimated at around $17 billion in 2003. The value of its exports at that time was around $8 billion. Canadian Wood products manufacturers are experiencing an acute shortage of employable people. This is a common and urgent concern among firms of all sizes, and within all sub-sectors. The wood products sector is not alone. Manufacturers in many other parts of the economy also are extremely concerned about this problem. A recently commissioned Wood Manufacturing Council Human Resource Sector Study identified a range of employment and labour market issues related to the apparent shortage of labour including an acute shortage of vital skills. Based on extensive interviews with advanced wood products manufacturers and related parties carried out as part of this study, the study concludes that the ‘skills gap’ is due to a wide range of direct, indirect and frequently interlinked factors. The impacts are significant. Some manufacturers identify the lack of labour flexibility and mobility as the most immediate cause of their inability to expand their business. Others report that labour and skills shortages are preventing them from modernizing. They want to use more equipment, but can’t find qualified operators. Employment in the sector grew rapidly during the 1990s, from around 67,000 persons in 1992 to about 131,000 persons by 2003. Between 2003 and 2006, aggregate workforce growth slowed – due primarily to deteriorating demand conditions in the wood furniture sector. Although there are some large scale manufacturers, Canada’s advanced wood products manufacturing sector is highly fragmented. There are many thousands of small shops employing fewer than four people. Geographically, the sector is widely dispersed across Canada with large concentrations of manufacturing activity in or close to metropolitan areas. Regionally, the largest number of firms and employees are in Quebec and Ontario. The sector’s workforce grew between 1999 and 2003 at around six percent annually. Over 131,000 persons were employed in the sector in 2003. Nearly 76,000 persons (58% of the sector’s workforce) were employed in furniture and cabinet-making. Furniture manufacturing is the largest single sub-sector in terms of employment, with more than 52,400 persons employed in 2003. Employment growth averaged 4.4% per year (1999-2003) – slower than the average rate for the sector overall (6.2%). Millwork manufacturing is the second largest sub-sector (over 30,000 persons employed in 2003), and exhibited one of the fastest rates of workforce growth over the period (8.3% average annually). Kitchen and bathroom cabinets, responding to very high levels of new homebuilding and renovations, employed over 23,000 persons in 2003 – and experienced a very rapid 9.8% annual growth rate in its workforce. Window and door production and building components and factory-built housing employed about the same number of persons in 2003 – between 13,500 to 14,500 persons in each case. Factory-built housing and building components manufacturing is comparatively labour intensive, and this sub-sector’s workforce grew at a comparatively high average annual rate of 7.1% over the five year period to 2003. Canada’s window and door manufacturing sub-sector, on the other hand, includes a number of larger scale firms along with numerous specialty producers. Its overall workforce growth was a fairly modest 3.4% over the period-reflecting a high degree of capital intensity. Small shops employing up to 4 persons are the heart of Canada’s advanced wood processing sector, accounting for 60% of all establishments. However, Canada also has many global scale and internationally renowned, leading-edge medium and large scale producers. Many of these are very large scale employers. What is the Advanced Wood Products (AWP) manufacturing sector? The AWP sector is an important part of Canada’s manufacturing industry. It covers all businesses or enterprises that produce wood products that have been altered from their original form so that they become “valued-added” or “finished” marketable goods. Our manufacturers produce some of the most beautiful, durable and cherished products in homes and businesses. These advanced wood products are produced in five industries; furniture industry, cabinet industry, wood & door industry, millwork industry, and factory-built housing & building components industry. Examples of finished products include wood and upholstered furniture, kitchen cabinets, wood windows and doors. Primary forests products such as basic lumber or paper products are not covered in this sector. Where types of jobs are available in the wood manufacturing industry? People working in the wood manufacturing industry can work in production and operations, design, as technicians, mangers, supervisors, in an apprentice trade, support trade, as well as in marketing, clerical, secretarial and customer service. For more information on jobs in the industry visit the Careers Profiles section of this web site. What are the skills required to work in the wood manufacturing industry? The wood manufacturing industry typically attracts people who enjoy building things and take pride in doing work to precise specifications. With changes in the technology requirements of the industry you also need to understand automated and computerized production machinery. The most common skills sought by companies for new management, professional and supervisory employees are leadership, communication, technical, management, business, and computer skills. Companies hiring new production/trades employees identified attitude, technical ability, flexibility, communication skills, safety and leadership as the skills they look for. The wide variety of positions available in the sector means there are likely ones suited to your skills. On the job and formal training opportunities are also widely available. What can I study for a career in the wood manufacturing industry? A good education is the key to success in every occupation. In the wood manufacturing industry having a solid foundation in math, science and communication is extremely important. The industry is looking to attract candidates who can work smart, think creatively and, communicate effectively. Additionally, changes and advancement in technology often require training and retraining to keep up with the demands in the industry. If you prefer to go directly from high school to work, the sector has many entry level positions available. An increasing number of Canadian high schools are offering WoodLINKS, a course that prepares you for entry level work in the sector. For more information on schools and programs go the Education section for a list of schools and programs. Is it true that we are running out of trees and killing trees just to make our lives better? We are not running out of trees! But, sustainability is a common concern for everyone especially our youth. Messaging from some environmental groups has led to a fear or guilt about using wood. We know that forest practices in Canada are some of the best regulated in the world. We replant or encourage the re-growth of all the forest land we harvest. In Canada government’s own 94% of our forested lands. This means that governments are responsible for meeting the demands of the public, and ensuring that forests are harvested in a sustainable manner. With advancements in science, engineering and technology, we now have modern mills and processes that allow us to covert up to 95% of every log into some kind of marketable product. Technology allows us to get the maximum number of quality boards and lumber from each log. In modern mills even sawdust is collected because there is a market for converting sawdust into particle board. Why don’t we just use hemp, that way we don’t have to cut down the forest? There are some who believe that we can make products using hemp and leave the trees in the forest. However, the land base required to grow enough hemp to replace wood fibre is immense. Agricultural land is already at a premium and we don’t want to clear forest land to create planting areas for hemp. Hemp is a monoculture which means a decrease in biodiversity from forests. Because it is an agricultural crop it requires herbicides and pesticides to grow. These crop lands also exclude wildlife, thereby decreasing diversity in animal habitat. This is not the case for forests. Does working in the wood sector mean that I will have to live in a small town somewhere away from the cities? Wood manufacturing does not happen in the forest. Some of the biggest manufacturers are in large cities, for example Toronto, Montreal, Winnipeg and Vancouver. While there is a predominance of men in this industry, we are seeing more and more women. We are attempting to overcome the image of working in the industry as one where the work requires someone with big muscles, capable of heavy labour. More and more women are identifying opportunities in the industry in design, production, operations, and quality control, just to name a few. To find our more about successful women in the industry visit our Careers Profiles Section of this web site. Will the jobs in this industry last? There is a perception that a career in wood is old fashioned and low-tech and that more modern materials will be invented to replace wood resulting in the disappearance of careers in this industry. Wood is the most renewable, recyclable, and environmentally friendly building material we have on this planet. We cannot control the regeneration of any other material. You cannot replant steel; but you can grow wood in a natural factory powered by sun. This industry is here to stay. Is this a dangerous industry to work in? This industry does have hazards. When working with power tools, chemicals, and heavy machinery there are safety procedures that must be followed and protective clothing that you have to wear to ensure your personal safety as well as the safety of others. There are also many other career opportunities in the industry including sales, marketing, design, and customer service. It is also important to recognize that many industries have elements of danger, not just those in the wood manufacturing industry. Safety should always be a top priority in this and any work environment. While overall, salaries for some positions tend to be lower than in other manufacturing sectors, students completing a degree program in wood products processing will start at a higher salary than those completing a one year certificate program. University graduates can earn an average starting salary of $50,000 a year. There are many different educational paths into the industry; including a Bachelor of Science degree specializing in wood products manufacturing as well as several applied degrees offered at community colleges. Check out the Education and Career Roadmaps section of this web site for more information. I’m a hands-on type of person, more of an artistic type, where do I fit into the industry? There are carpentry classes, joinery, and fine furniture courses available for those who enjoy working their hands. As well, design is one area where Canada’s wood industry is starting to grow. The industry needs creative and artistic people to design that uniquely Canadian product! There are several specialized wood design programs available. Check out the Education section to find out more. What is an apprenticeship and how does it work? An apprenticeship is a way to learn job skills while you are working. It combines classroom study with on-the-job experience. Classes are often offered at community colleges and some are offered in high schools. You graduate as a Certified Journeyman when you finish your program and meet the industry standards. To become an apprentice, you apply to an employer, union, or local apprenticing committee. The regulations governing apprenticeships are different depending on where you live in Canada. For provincial and territorial information on apprenticeship click here. What careers in wood manufacturing are Red Seal” certified? The Red Seal Program was established to provide greater ease for mobility of skilled workers throughout Canada. In the wood manufacturing sector, cabinetmaker is a Red Seal certified trade. For a list of all Red Seal trades and to learn more about apprenticeship, national standards and trade certification visit the Red Seal web site. Where can I find out more information about a career in the wood manufacturing industry? CareersInWood.ca is one of the most comprehensive sites on careers in wood manufacturing. You can also visit the Wood Manufacturing Sector Council’s website at www.wmc-cfb.ca and follow the links on our site to associations and company websites in our sector.